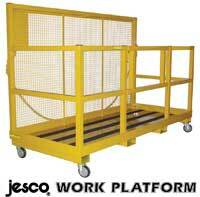 The platform from Jesco Industries is constructed with 2-inch square tube. The platform from Jesco Industries is constructed with 2-inch square tube. The base and 4-inch side curbs are formed from one piece of heavy-gauge sheet for extra strength. The unit’s safety screen back is 63 inches high. The deck has a slip-resistant surface, and the hinge gate has a built-in pin safety lock. The unit has safety pins behind each fork. Heavy-duty chains are welded to the platform for securing to the forklift carriage. The platform is available in 72, 96, and 120 inches long, and meets or exceeds OSHA safety guidelines.